develop a new e-commerce website which would improve user experience, admin management and a new contemporary design and layout which supported their current branding. The current CosNatural E-commerce site was built using Opencart 1.5.6, and while CosNatural were happy with this they wanted to upgrade to the latest version of the Opencart platform version 2.3 to keep up-to-date with latest coding and practices. CosNatural also required the new design to have a mobile, tablet and desktop responsive layout, something which the old site did not support. CosNatural had seen by way of analytics that the number of mobile visitors were rapidly increasing, so this was a critical part of the new project. 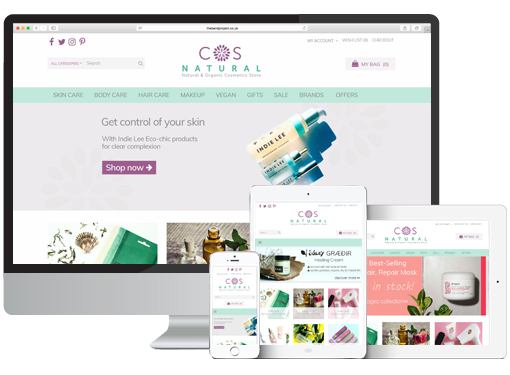 Another requirement was to improve the site navigation, search and product filtering, CosNatural wanted their customers to be able to easily navigate and filter through their content with ease. CosNatural also required a smooth, secure checkout process which supported their current payment methods. E-commerce web hosting was another requirement on their project brief, CosNatural wanted to move away from their current web host so they could have full flexibilty and control of their files, email and SSL certificates. With CosNatural being an emerging leader in natural and organic cosmetics and their clear vision for the future, we had to be at the top of our game and deliver a solution which complemented the CosNatural brand and fulfill the requirements of the brief. The first part of the project was to get their new server up and running and migrate the current website files and database to the new server. We could then upgrade the current site files to the latest version of Opencart 2.3 and create a development site. We did this so CosNatural could continue taking sales of their live site while we tested and developed the new site on the new server. We then had a working version of their site on the Opencart 2.3 platform. This instantly provided a much improved admin user interface for easy in-house management, better security, improved functionality and new features included in the latest version of Opencart. We then began designing the new e-commerce site, and provided CosNatural with design and layout visuals for feedback and finalisation. The new Opencart store was built with a responsive layout utilising the Bootstrap CSS framework which helped us provide a much improved user experience whether users were on mobile, tablet or desktop. Enhanced navigation, searchabilty and filtering was also a feature which CosNatural required on the new store. For this we integrated a module called Ultimate Filters provided from one of our partners Clear Thinking which gave us the functionality we required. This fantastic module allowed us to filter products, categories, brands and other criteria so users could easily find the products they required. Finally we needed to integrate SagePay V3 and Paypal modules into the store, for taking online payments. We also installed an SSL certificate on the server and secured the checkout, customer login and admin areas. Once we completed the design and build on the development site, we then performed the final migration and upgrade of the live site.